Joshua Humphreys (June 17, 1751 – January 12, 1838) was an American ship builder and naval architect. He was the constructor of the original six frigates of the United States Navy and is known as the "Father of the American Navy". 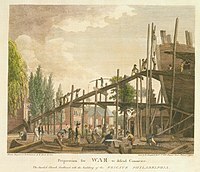 The building of the Frigate Philadelphia, Plate 29 of Birch's Views of Philadelphia (1800). The man standing in the foreground may be a portrait of Humphreys. Humphreys was born in Havertown, Haverford Township, Pennsylvania, and died in the same place. He was the son of Joshua Humphreys and Sarah Williams, grandson of Daniel Humphreys and Hannah Wynne (daughter of Dr. Thomas Wynne). He was a nephew of Charles Humphreys. His residence, Pont Reading, is still a private residence. As a youth, Humphreys was apprenticed to a shipbuilder in Philadelphia, Pennsylvania. During his apprenticeship, his instructor died and he was placed in charge of the establishment. During the American Revolutionary War he was active as a designer, and played a major part in planning the 32-gun frigate USS Randolph before the British Army occupation of Philadelphia halted that effort. In postwar Philadelphia, Humphreys became a shipbuilder in Philadelphia and was one of the most sought after and busiest. His main shipyard complex was on the Delaware River in the Southwark neighborhood. When Congress passed the Naval Act of 1794 providing for the construction of six frigates, it called on him to design them. He was appointed Naval Constructor on June 28, 1794 and began work on these ships, the beginnings of the U.S. Navy. Reputedly, one of the inspirations for his frigate designs was the South Carolina. His designs called for ships that were longer and wider than usual, sat lower in the water and were able to equal the speed of any other fighting ships. The ships Humphrey built were more stable than other ships at the time and could carry as many guns on one deck as others did on two deck. His uncle was Charles Humphreys, a member of the Continental Congress. His son was another noted naval architect, Samuel Humphreys. His grandson, General Andrew Atkinson Humphreys, served throughout the American Civil War. Two ships, USS Humphreys (DD-236) and USNS Joshua Humphreys (T-AO-188), were named for Humphreys. Building 197 of the Washington Navy Yard was completely renovated in 2014 and renamed in honor of Humphreys. The building was the site of the Washington Navy Yard shooting on September 16, 2013. ^ Proceedings of the Delaware County Historical Society, Volume 1. Chester, Pennsylvania: Delaware County Historical Society. 1902. p. 67. Retrieved 14 April 2018. ^ Proceedings of the Delaware County Historical Society, Volume 1. Chester, Pennsylvania: Delaware County Historical Society. 1902. p. 66. Retrieved 14 April 2018. ^ Leiner, Frederick (2000). Millions for Defense: The Subscription Warships of 1798. Annapolis, MD: Naval Institute Press. ISBN 978-1-61251-348-5. Retrieved 15 April 2018. ^ Toll, Ian W. (2006). Six Frigates: The Epic History of the Founding of the U.S. Navy. New York: W.W. Norton & Company. p. 47. ISBN 978-0-393-05847-5. Retrieved 15 April 2018. ^ "Joshua Humphreys". www.britannica.com. Retrieved 15 April 2018. ^ Wick, Joshua L. "NAVSEA Dedicates Building to Historic Shipbuilder". www.navy.mil. Retrieved 15 April 2018. ^ "4 killed, 8 injured in a shooting at Washington Navy Yard". Washington Times. Retrieved April 15, 2018. The Joshua Humphreys Papers, including financial records, hand-drawn diagrams, correspondence and other family documents, are available for research use at the Historical Society of Pennsylvania. This page was last edited on 5 April 2019, at 05:41 (UTC).